Transfer the pork to a heavy storage bag and set aside. In the blender, combine the annatto paste, chipotle peppers, white onion, garlic, bay leaves, tomatoes, 1 cup fresh pineapple, apple cider vinegar, water, oregano, 2 teaspoons of salt and 1 1/2 teaspoons pepper. Blend until smooth and taste for salt. Pour marinade over pork, seal bag and marinate for 24 hours. Remove the pork from the refrigerator 30 minutes before roasting. Preheat the oven to 350° F.
Transfer the pork and all the marinade into a deep roasting pan. Discard storage bag. Cover with lid and roast for 2 hours. Uncover after 2 hours and continue roasting for another hour, basting every 20 minutes. In a small bowl, combine the thinly sliced red onion, red wine vinegar and 1 1/2 teaspoons of salt. Stir well to combine, cover and set aside. In a large bowl, add the remaining pineapple, diced red onion, Serrano peppers, bell pepper, cilantro, lime juice, 1 teaspoon salt and 1/2 teaspoon of pepper. Stir well to combine, taste for salt, cover and set aside. When ready, remove the pork from the oven and let it rest for 20 minutes before slicing or chopping. Transfer the pork to a serving dish, pour the pan juices over it, and cover to keep warm. Warm the corn tortillas on a large griddle or comal and wrap in foil paper to keep warm. Garnish tacos with pineapple salsa and pickled red onions. Grilling fruits like pineapple and mango brings out their sweetness and adds a nice smoky flavor. An authentic preparation of tacos al pastor is a sight to remember: stacks of pork, pineapple, onions and spices all layered on a vertical barbeque rotisserie spit. 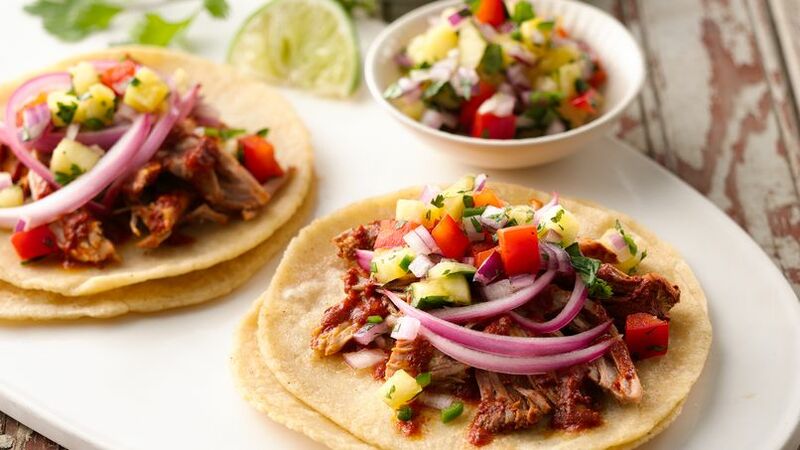 The sweetness of the pineapple and spiciness of the chipotle make for a delicious taco!